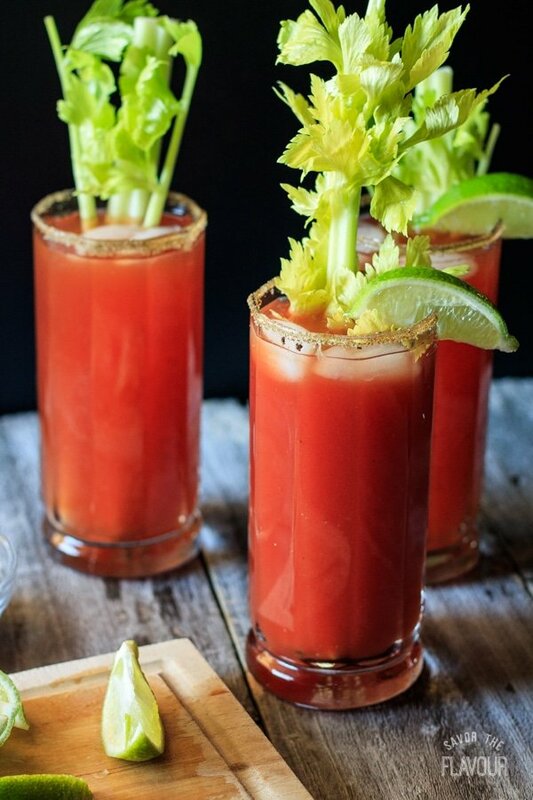 This is an easy recipe for a non alcoholic Caesar with classic clamato and a simple garnish of celery salt and a celery stick. Make it spicy or mild! 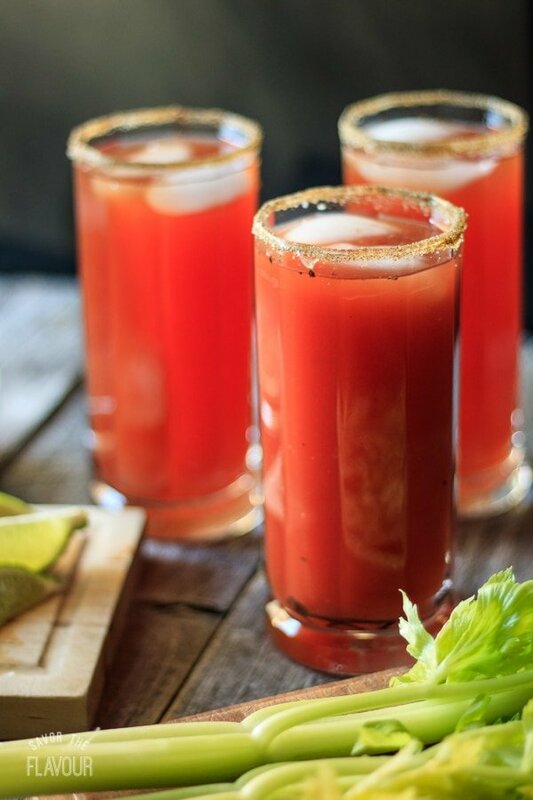 A classic Caesar mocktail is a super easy Canadian drink to mix up for everyone in your house to enjoy. Do you have kids that won’t drink tomato juice? Are you trying to get them to drink healthier beverages? Well, look no further. 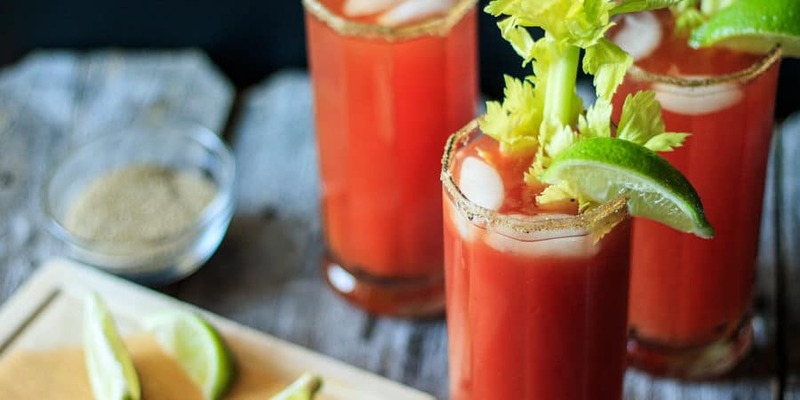 The classic Caesar mocktail is your answer. One really cool thing about this drink is it comes with a snack. 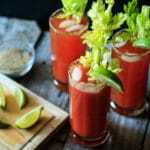 Traditionally, it is served with a fresh celery spear with the leaves still on it and a lime wedge. This is my favorite way to serve it, but feel free to change it up. This beverage can be served with a whole variety of snacks either inserted into the tall glass standing up on a long skewer or laid across the top of the glass on a small skewer. By doing this, you can customize each drink, plus it makes it a lot of fun. You can also go to the extreme and make it a meal, by crowding the drink with lots of skewers full of interesting munchies. The more the better. Try a long pickle spear, thick maple bacon, beef jerky, a spicy chicken wing, salami, pickled vegetables, assorted cheeses, hot peppers, olives, and a club or grilled cheese sandwich triangle. Wash a lime then wedge it. Cut a small slit in the center of the lime wedge and run it around the edge of a tall glass. Pour two tablespoons of celery salt in a small dish. Insert the rim of the glass in the celery salt and twist it. This will give the rim a nice coating of celery salt. This is an important step, so don’t omit it. Add a few cubes of ice to the glass, then pour in the Clamato juice. Add equal parts of Tabasco sauce and Worcestershire sauce. For an extremely mild version, use 2 dashes of each, and for a spicier version try 6 dashes. Stir carefully with a long handled spoon. Taste. If necessary, add more Tabasco or Worcestershire sauce. Sprinkle on some freshly ground black pepper on top. Garnish with another lime wedge and a celery stalk with leaves. If you are serving this to a child, decrease the hot sauce. Feel free to be creative in your garnishes. The idea is to provide a fun snack that goes with the drink. Another popular variation is adding horseradish. You could “theme night’ this drink by taking it to the extreme and have your whole dinner skewered and standing up in the drink. Just make sure the glass your serving it in is bottom heavy. To save time, two people could share the same skewer meal especially if they aren’t big eaters.